A few weeks ago I shared this tutorial over at Dollar Store Crafts. Today I'm going to share it here as the perfect holiday gift for the kiddies (or to keep said kiddies busy while you do a bunch of other holiday things). Easy, fun & cheap. You can't go wrong! So I came up with a method so anyone could make one in one day and for way cheap. 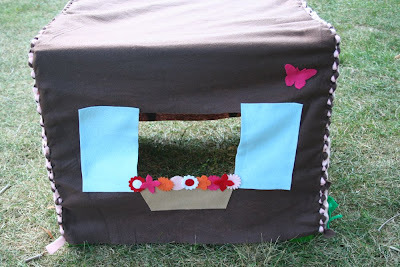 If you can use scissors and glue, YOU can make a felt playhouse like this. First you'll need to measure your table to figure out your felt size for the roof & walls. 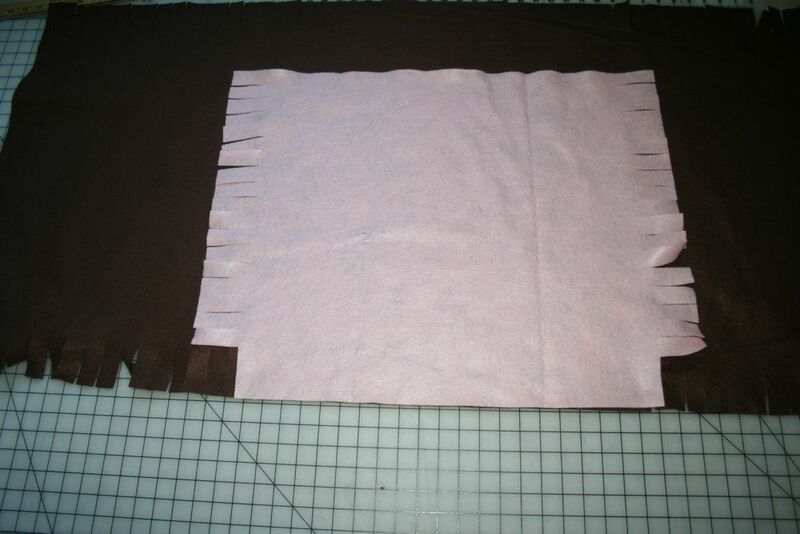 To make it easy I used one long piece to cover the top & 2 sides and then two other pieces for the remaining sides. 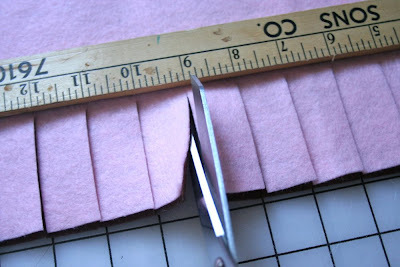 For your long piece measure from the bottom of one side up over the top & back down to the bottom of the other side to get the length, then measure across one side to get the width and add 8 inches to the width (this is for the no-sew attachment). 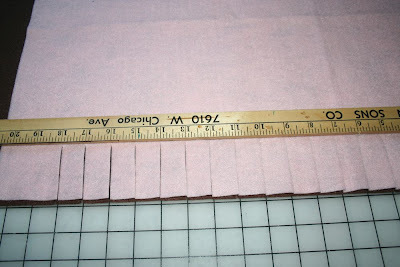 For the two smaller sides measure from bottom to top of table for length and add 4 inches, then measure width and add 8 inches. 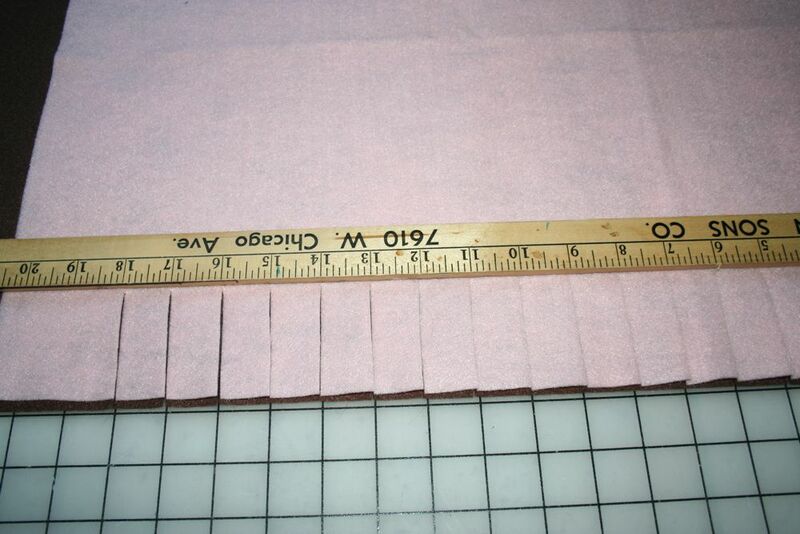 The yardstick will help keep all the strips exactly the same size which is important for tying later. Line the side piece up with the roof section of the long rectangle and cut 1 inch strips as done previously. Repeat to finish the other side. Now it's ready to decorate. 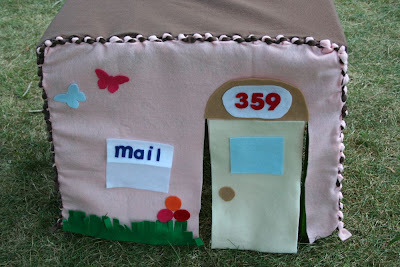 Cut windows & a door (using the yard stick & marking pen or chalk to mark the lines and decide on placement before you cut) and then let your imagination run wild with added design elements that you simply glue on. Now it's ready for some little residents! The possibilities are endless and with all the time saved not having to sew it together, you can add all kinds of fun details. For some more felt playhouse design ideas, just click here. Thank you for sharing this! I made one that I had to sew and it turned out really bad. I blogged about it but you may want to divert your eyes lol. Super cute! 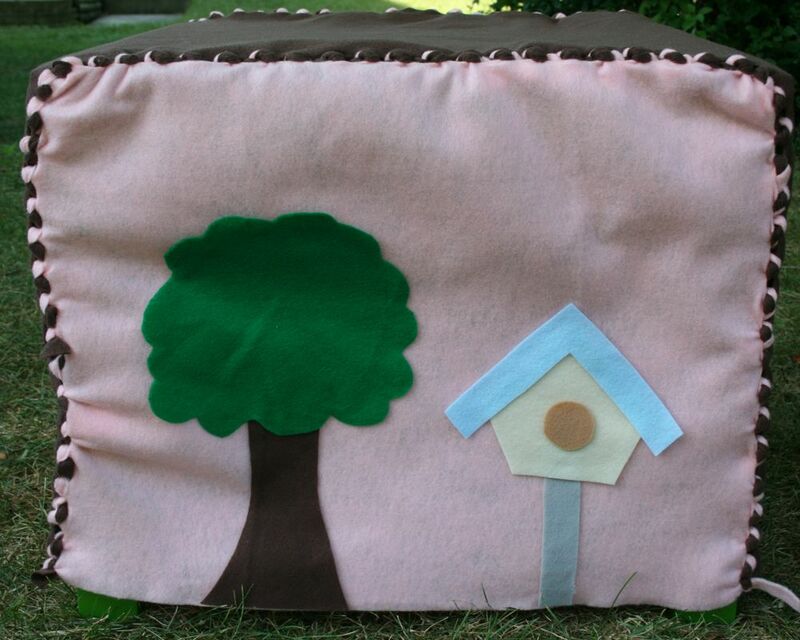 I love that it is no sew too! Great job! You had me at "no-sew!" This is so simple and cute. Thanks for showing us how to do it! This is a great idea! Definitely leaves more time for the fun details - like velcro apples for the tree, etc. I love this to pieces! 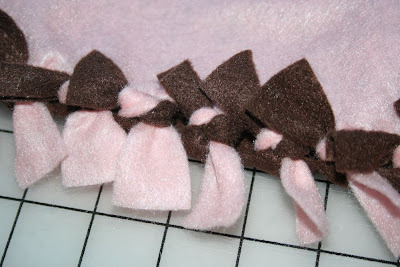 Such a sweet idea with the no sew & the knot pattern is awesome. This is so creative! I have a niece that would just love to play in something like that! 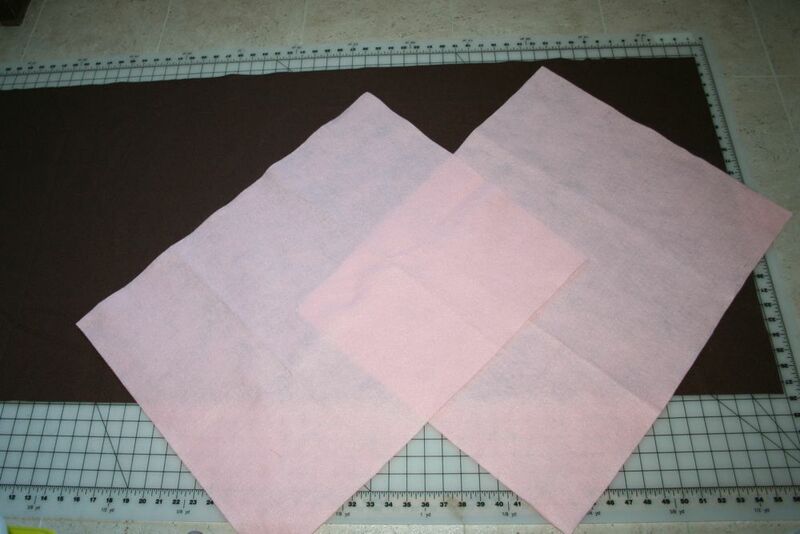 I love this solution, so easy and better that sewing up a time-consuming one! Quick, yet attractive! This is so adorable. I love all the details you added! Thanks for linking up to Theme Party Thursday! Our best friends have toddlers (we have teenagers) and something like this would be awesome to have stashed when they come for dinner! 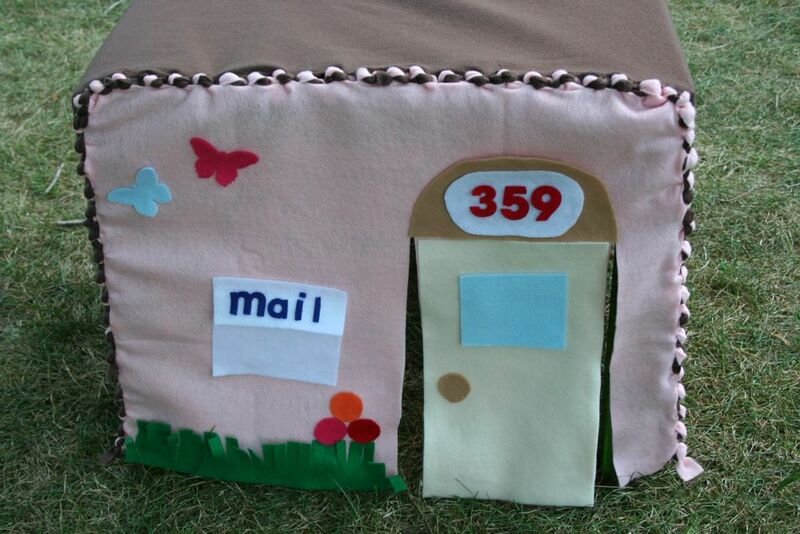 What a darling idea - all kids would love this! What a great idea! Thanks for sharing on Crafty Friday! I love it! 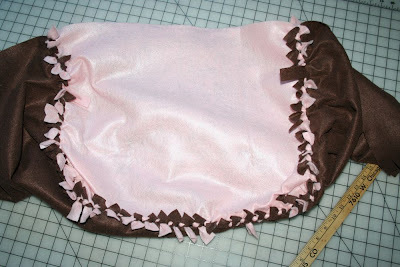 Being no-sew makes it something I could probably do and my daughter would like it. What fun! 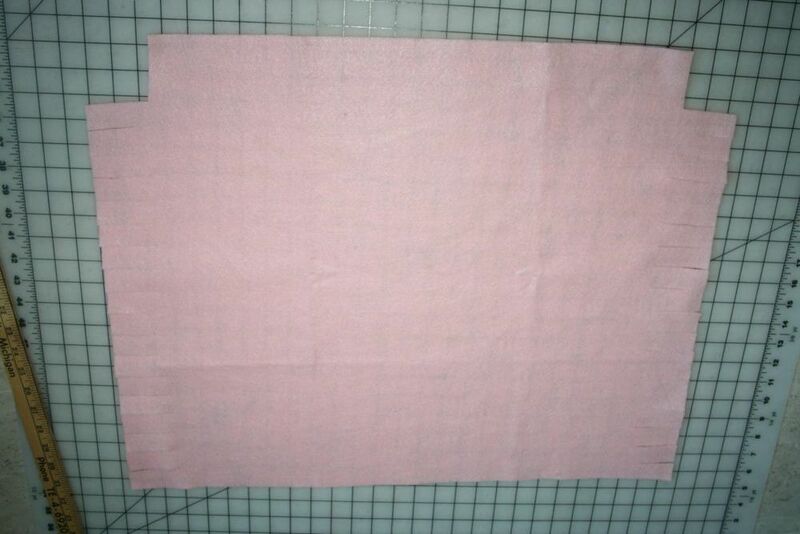 I hadn't thought to make a no sew version. Very cute! Thanks for linking up to Topsy Turvy Tuesday's! Thanks SO much for linking this up at Fancy This Fridays!!! Hope you come back again!! WOW! What a neat project. I'm stopping in from Thrifty Thursday, and am now a follower! That is awesome! I had one of those as a kid and loved it. This is great for a non-sewing girl such as myself! 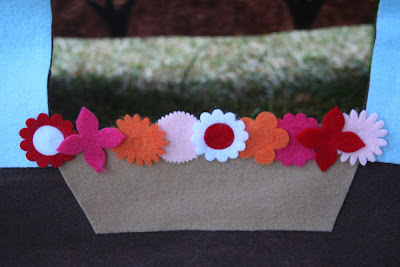 Question- could you use a hot glue gun for the details? Or do you find that white glue works better? Either one should work - just make sure you use the low heat setting on the glue gun (it's the fabric-friendly one). Thanks! 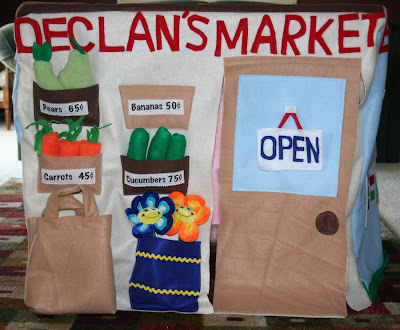 One more thing...can you explain how you hung the OPEN sign on Declan's Market? I am assuming it comes off and has a CLOSED side? But maybe not and it is just sewn on? Yes the sign has "open" on one side and "closed" on the other. It's held onto the door with a little velcro at the top of it and on the door (so it will stick on either side).